...I love them. They lead up to my favorite day of the year, the day of joy and miracles and beauty. I love the candles on the Advent wreath in the evenings, giving the room an almost magical glow. I love the baking, the smells of fudge and cookies filling the kitchen and making me fairly swoon. I love decorating the house on Christmas Eve (family tradition) and the smell of pine that fills the house. I love the Christmas music, that has it's own special feel that makes me all warm inside. I love just sitting and staring at the tree, the ornaments sparkling and shining. 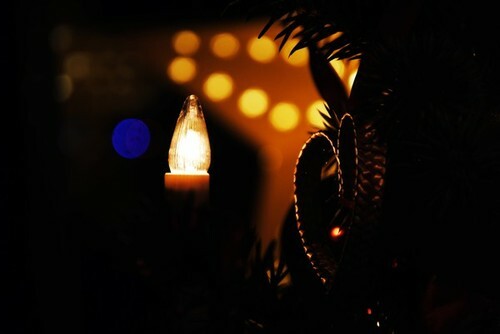 I love Christmas, because it has it's own feel. A feeling of comfort and happiness and warmth. It's almost like you can feel God's presence that much more strongly. If only it always felt like Christmas. I agree, there is just something about Christmas that makes me happy. I have always wanted to try decorating on Christmas eve. We have never done it but I think it might be cool to try some year.